Shiohara T1, Ushigome Y1, Kano Y1, Takahashi R(1Department of Dermatology): : Crucial role of viral reactivation in the development of severe drug eruptions: a comprehensive review. Clin Rev Allergy Immunol 49:192-202, 2015. Shiohara T1, Ushigome Y1, Kano Y1, and Takahashi R (1Department of Dermatology): Crucial Role of Viral Reactivation in the Development of Severe Drug Eruptions: a Comprehensive Review. Clinical Reviews in Allergy & Immunology (Published online: 16 Apr 2014). Takahashi R, Sato Y1, Kurata M1, Yamazaki Y1, Kimishima M1, and Shiohara T1 (1Department of Dermatology): Pathological role of regulatory T cells in the initiation and maintenance of eczema herpeticum lesions. The Journal of Immunology 192: 969-978. 2014. Shiohara T1, Takahashi R, Yukiko Ushigome1, and Kano,Y1 (1Department of Dermatology): Regulatory T cells in severe drug eruption. Current Immunology Review 2014, 10, 41-50. Shiohara T1, Kano Y1, Takahashi R, Ishida T1, Mizukawa Y1 (1Department of Dermatology): Drug-induced hypersensitivity syndrome: recent advances in the diagnosis, pathogenesis and management: Chem Immunol Allergy. 97:122-38, 2012. 石田正1, 高橋 良, 塩原哲夫1(1皮膚科), 制御性T細胞と重症薬疹：日本皮膚科学会雑誌 121巻: 2682〜2685, 2011. Hirahara K1, Kano Y1, Mitsuyama Y1, Takahashi R, Kimishima M1, Shiohara T1(1Department of Dermatology): Differences in immunological alterations and underlying viral infections in two well-defined severe drug eruptions. Clin Exp Dermatol 35: 863-868, 2010. Shiohara T1, Kano Y1, and Takahashi R (1Department of Dermatology). Current concepts on the diagnosis and pathogenesis of drug-induced hypersensitivity syndrome: JMAJ 52:347-352, 2009. Takahashi R, Kano Y1 ,Yamazaki Y1, Kimishima M1, Mizukawa Y1, and Shiohara T1 (1Department of Dermatology). Defective regulatory T cells in patients with severe drug eruptions: timing of the dysfunction is associated with the pathological phenotype and outcome: The Journal of Immunology 182:8071-79, 2009. Shiohara T1, Mizukawa Y1, Takahashi R, Kano Y1 (1Department of Dermatology). Pathomechanisms of lichen planus autoimmunity elicited by cross-reactive T cells: Curr Dir Autoimmun 10:206-26. Review, 2008. Mizukawa Y1, Takahashi R, Yamazaki Y1, Kimishima M1, and Shiohara T1 (1Department of Dermatology): Fucosyltransferase VII positive, skin-homing T cells in the blood and skin lesions of atopic dermatitis patients: Exp Dermatol 17:170-6, 2008. Kano Y1, Hirahara K1, Mitsuyama Y1, Takahashi R, Shiohara T1 (1Department of Dermatology): Utility of the lymphocyte transformation test in the diagnosis of drug sensitivity: dependence on its timing and the type of drug eruption: Allergy 62: 1439-1444, 2007. Hasannejad H1, Takahashi R (Corresponding author), Kimishima M1, Hayakawa K1, Shiohara T1 (1Department of Dermatology): Selective impairment of Toll-like receptor 2-mediated proinflammatory cytokine production by monocytes from patients with atopic dermatitis: J Allergy Clin Immunol,120, 69-75，2007. Inaoka M1, Kimishima M1, Takahashi R, Shiohara T1 (1Department of Dermatology): Non-steroidal anti-inflammatory drugs selectively inhibit cytokine production by NK cells and gamma delta T cells: Exp Dermatol 15:981-990, 2006. Katsuta M1, Takigawa Y1, Kimishima M1, Inaoka M1, Takahashi R, Shiohara T1 (1Department of Dermatology): NK cells and gamma delta+ T cells are phenotypically and functionally defective due to preferential apoptosis in patients with atopic dermatitis: The Journal of Immunology, 176:7736-7744, 2006. 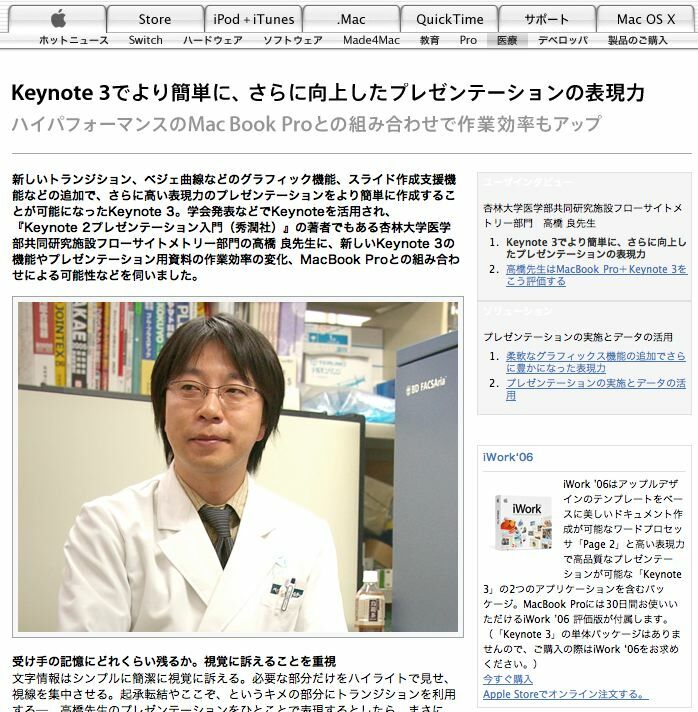 高橋 良：Apple特集#7 「Keynote -プレゼンに差をつけたいユーザーへ-」：32~33頁：PC-Webzine12月号　vol.178. Shiohara1, Mizukawa Y1, Takahashi R, Jun Hayakawa1 & Kazuhito Hayakawa1 (1Department of Dermatology): T-cell dynamics of inflammatory skin diseases: Expert Review of Clinical Immunology 1：357-368，2005. Takahashi R, Mizukawa Y1, Yamazaki Y1, Hayakawa K1, Hayakawa J1, Kudo A2 and Shiohara T1 (1Department of Dermatology, 2Department of Anatomy): In Vitro Differentiation from Naive to Mature E-Selectin Binding CD4 T Cells: Acquisition of Skin-Homing Properties Occurs Independently of Cutaneous Lymphocyte Antigen Expression： The Journal of Immunology, 171: 5769-5777, 2003. Mizukawa Y1, Shitara K2, Yamazaki Y1, Teraki Y1, Takahashi R, Narimatsu H3 & Shiohra T1 (1Departments of Dermatology, 2Research Laboratories, Kyowa Hakko Kogyo Company, Ltd., 3Institute of Life Science, Soka University), Development and characterization of a monoclonal antibody specific for fucosyltransferase VII (Fuc-T VII): Discordant expression of CLA and Fuc-T VII in peripheral CD4+ and CD8+ T cells: J Invest Dermatol 117: 743-747, 2001. Kawano TA, Aoki N, Homori M, Kawano K, Maki A, Kimura M, Yanagisawa A, Ohsaki T, Takahashi R, Shiohara T, Ishikawa K, Yoshino H, Mental stress and physical exercise increase platelet-dependent thrombin generation: Heart Vessels. 2000;15(6):280-8. 中竹 俊彦, 高橋 良, 関根 名里子, 出血時間測定後の瘢痕化予防の発想とその実践指導: 医学検査 49(10), 1427-1430. 2000. 中竹 俊彦, 高橋 良, 関根 名里子, 骨髄像の解析学を特色ある臨床細胞学教育として位置づける方法と実践論: 医学検査 49(9), 1328-1331. 2000. Takahashi R, Sekine N, and Nakatake T, Influence of monoclonal antiplatelet glyco-protein antibodies on in vitro human megakaryocyte colony formation and proplatelet formation: Blood, 93 (6): 1951-1958, 1999 特記事項1：本論文の図がBlood 93 (6), 1999の表紙に採用された. 特記事項2：本論文要旨の学会発表「International Association of Medical Laboratory Technologists (IAMLT), 23rd World Congress of Medical Technology, Singapore, June 28 - July 3, 19」は，「GOOD POSTER DESIGN AWARD 1998 IAMLT」を受賞. 高橋 良, 臨床検査でのデジタルカメラの活用法　低価格デジタルカメラを使用した顕微鏡写真撮影のテクニックとプロフェッショナル 用最新デジタルカメラの紹介: 都臨技会誌, 27 (2), 19 – 28. 1999. 高橋 良, 関根名里子, 中竹俊彦, ヒト末梢血単核細胞からの巨核球系コロニー形成における遺伝子組換え型ヒトトロンボポエチンの効果　‐無血清培養による検 討‐: 医学検査, 46 (7), 1064 – 1067. 1997.特記事項：本論文は、日本臨床衛生検査技師会 会長賞を受賞した（1998年）. 中竹 俊彦, 田中 薫, 高橋 良, 関根 名里子, 村上 映治, 佐久間 孝志, マルチメディア骨髄像判読トレーニングシステム『マルクマスター』の開発: 医学検査, 47(1), 50-53. 1997. 高橋 良, 関根名里子, 中竹俊彦, 特発性血小板減少性紫斑病の巨核球細胞質空胞の血液学的意義：臨床病理, 45 (1): 67 – 71. 1997. Shiohara T1, Sato Y1, Takahashi R, Kurata M1, Mizukawa Y1 (1Department of Dermatology): Increased susceptibility to cutaneous viral infections in atopic dermatitis: the roles of regulatory T cells and innate immune defects. In: Current Problems in Dermatology, vol. 41. Pathomechanisms, diagnosis and management of atopic dermatitis. Shiohara T, ed. Karger AG, Basel. 2011. Shiohara T1, Mizukawa Y1,Takahashi R, and Kano Y1 (1Department of Dermatology): Pathomechanisms of lichen planus. Autoimmunity elicited by cross-reactive T cells. In Current Directions in Autoimmunity: Dermatologic Autoimmunity. Nickoloff, B.J. and Nestle, F., eds. Basel, Karger Press, 206-226, 2008. Shiohara T1,Takahashi R, and Kano Y1 (1Department of Dermatology): Drug-Induced Hypersensitivity Syndrome and Viral Reactivation. Drug Hypersensitivity. Basel, Karger, 224-239, 2007. Takahashi R, Sato Y, Kimishima M, Shiohara T, Ohyama M: Characterization of the influence of PD-1 blockade on IFN-γ, granzyme B and IL-9 production by T cells in advanced melanoma patients. The 42st Annual meeting of the Japanese society for investigative dermatology, Kochi, Japan, December 16th-17th, 2017. Sato Y, Takahashi R, Yamazaki Y, Ohyama M: Quantitative clinicopathological analyses identify poor prognostic factors for systemic steroid pulse therapy in acute slopecia areata. 10th World Congress for Hair Research, Kyoto, Japan, November 2nd, 2017. Takahashi R Sato Y, Kimishima M, Shiohara T, Ohyama M: Influence of programmed cell death-1 immune checkpoint blockade on T cell profile and resposen to melanoma-associated antigen in advanced malignant melanoma patients. 47th Annual European Society for Dermatological Research Meeting, Salzburg, Autria, September 30th, 2017. Sato Y, Takahashi R, Kimishima M, Yamaszaki Y, Shiohara T, Ohyama M. Identification of early predictors of the efficacy of intravenous corticosteroid pulse therapy in rapidly-progessive diffuse alopecia areata patients. 76th Annual Meeting of of the Society for Investigative Dermatology, Portland, USA, April 27th, 2017. Sato Y, Takahashi R, Hayakawa J, Ohyama M. Attempt to identify predictors for outcomes of intravenous corticosteroid pulse therapy for rapidly progressive alopecia areata. The 4th Eastern Asia Dermatology Congress, Nov 16-18, 2016. Urayasu, Japan. Ryo Takahashi, Yukiko Ushigome, Tetsuo Shiohara: An unfavorable shift from Treg to Th17 development can be preventable by selective depletion of IL-6-producing proinflammatory monocytes. 40th Annual Meeting of the Japanese Society for Investigative Dermatology, Okayama, December 11-13th, 2015. Ryo Takahashi, Yukiko Ushigome1, and Tetsuo Shiohara1 (1Dept. of Dermatology): Monocytes are crucial for a shift away from a Treg to Th17 response in mycoplasma pneumoniae infection and SJS/TEN, The 39th Annual Meeting of the Japanese Society for Investigative Dermatology, Osaka, Dec 12-14, 2014. Takahashi R, Yukiko Ushigome1, Tetsuo Shiohara1 (1Dept. of Dermatology): Mycoplasma Pneumoniae Infections Serve To Enhance The Risk Of Subsequently Developing Severe Allergic Diseases By Chronically Abrogating Treg-mediated Suppression, The 6th drug hypersensitivity meeting (DHM6), Bern, Switzerland, April 9-12, 2014. Tetsuo Shiohara1, Takahashi R, Yoko Kano, Yukiko Ushigome1 (1Dept. of Dermatology): Monocytes control Treg in severe drug eruption, The 6th drug hypersensitivity meeting (DHM6), Bern, Switzerland, April 9-12, 2014. Yukiko Ushigome1, Takahashi R, Tetsuo Shiohara1 (1Dept. of Dermatology): Patrolling monocytes sensing herpes simplex virus in severe drug eruption, The 6th drug hypersensitivity meeting (DHM6), Bern, Switzerland, April 9-12, 2014. Yoshiko Mizukawa1, Takahashi R, Yoko Kano1, Tetsuo Shiohara1 (1Dept. of Dermatology): Mycoplasma infection as an inhibitory factor for developing DIHS/DRESS, The 6th drug hypersensitivity meeting (DHM6), Bern, Switzerland, April 9-12, 2014. 高橋 良: アトピー性皮膚炎患者におけるヘルペスウィルスの再活性化と制御性 T 細胞の動態. 第23回日本サイトメトリー学会　シンポジウム,　東京, 2013年6月22日. Takahashi R and Shiohara T1 (1Dept. of Dermatology):　Suppressive CD14dimCD16+ monocytes contribute defective anti-viral immune responses in eczema herpeticum, International Investigative Dermatology 2013, Edinburgh, Scotland, May 8-11, 2013. Ushigome Y1, Takahashi R, Shiohara T1: CD16+ patrolling monocytes (pMO) sensing HSV negatively control regulatory T cell (Treg) responses in severe drug eruptions, International Investigative Dermatology 2013, Edinburgh, Scotland, May 8-11, 2013. Takahashi R and Shiohara T1 (1Dept. of Dermatology):　Increased expression of PILRα on patrolling monocytes sensing HSV is the mechanism by which HSV evades immune attack, The International Investigative Dermatology 2012, Okinawa, Dec 7-8, 2012. Ushigome Y1, Takahashi R, Shiohara T1: Preferential elimination of patrolling monocytes sensing herpesvirus in drug-induced hypersensitivity syndrome, The International Investigative Dermatology 2012, Okinawa, Dec 7-8, 2012. Takahashi R, Yohei Sato1, and Shiohara T1 (1Dept. of Dermatology): Defective anti-viral immune responses and alternative activation of monocytes are triggered by expansions of Treg in eczema herpeticum, The International Investigative Dermatology 2011, Kyoto, Dec 9-10, 2011. Takahashi R, Yohei Sato1, and Shiohara T1 (1Dept. of Dermatology): Defective regulatory T cell function in HSV-seronegative atopic dermatitis patients, The International Investigative Dermatology 2010, Wakayama, Dec 3-5, 2010. Takahashi R, and Shiohara T1 (1Dept. of Dermatology): Mycoplasma pneumoniae infection predisposes individuals to severe drug eruptions by chronically abrogating regulatory T cell function, The International Investigative Dermatology 2009, Fukuoka, Dec 4-5, 2009. Yohei Sato1, Maiko Kurata1, Momoko Kimishima1, Takahashi R, Tetsuo Shiohara1 (1Dept. of Dermatology): Pathological role of regulatory T cells in the initiation and maintenance of Kaposi's varicelliform eruption lesions, The International Investigative Dermatology 2009, Fukuoka, Dec 4-5, 2009. Takahashi R, Kimisima M1, Yamazaki Y1, and Shiohara T1 (1Dept. of Dermatology): Severe drug hypersensitivity disorders is induced by dysfunctional Tregs, The International Investigative Dermatology 2008, Kyoto, May 14-17, 2008. Takahashi R and Shiohara T1 (1Dept. of Dermatology): Trafficking receptor expression on regulatory t cells in severe drug eruptions, 3rd International drug hypersensitivity meeting (DHM3), Paris, France, Apr 11-13, 2008. Kano Y1, Hirahara K1, Asano Y1, Mitsuyama Y1, Takahashi R, Shiohara T1 (1Department of Dermatology): Association between drug and human herpesvirus in drug-induced hypersensitivity syndrome/drug rash with eosinophilia and systemic symptoms. 3rd International drug hypersensitivity meeting (DHM3), Paris, France, Apr 12, 2008. Shiohara T1, Kano Y1, Takahashi R(1Department of Dermatology): Update on regulators: regulatory T cells in DIHS/DRESS and SJS/TEN. 3rd International drug hypersensitivity meeting. Paris, France, Apr 12, 2008. Takahashi R and Shiohara T1 (1Dept. of Dermatology): Dramatic expansion of Tregs with skin-homing potential followed by sequential reactivations of herpesviruses. The 32st annual meeting of the Japanese Society for Investigative Dermatology (プレナリー口演), Yokohama, Apr 18-20, 2007. Takahashi R: Recent flow cytometric analysis; cytometric beads array (CBA). Lunch Talk in International College (招待口演), Mahidol University, Bangkok, Thailand, Feb 20, 2007. Takahashi R, Mizukawa Y1, and Shiohara T1 (Dept. of Dermatology): Dynamic balance between Fuc T- IV and Fuc T- VII is a major check point for the regulation of skin-homing CD4+T cell differentiation. The 31st annual meeting of the Japanese Society for Investigative Dermatology (プレナリー口演), Kyoto, May 31-June 2, 2006. Takahashi R, Mizukawa Y1, and Shiohara T1 (1Department of Dermatology) ：Direct visualization of the expression of E-selectin ligands on human CD4 skin-homing T cells. Strategies for controlling emerging and reemerging infectious diseases in Southeast Asia in JSPS Core University Program (招待口演), Bangkok Thailand, Mar 27, 2006. Takahashi R, Mizukawa Y1, and Shiohara T1 (1Department of Dermatology) ：Coordinate and Ssequential expression of fucosyltransferases, FucT-4 and FucT-7, regulates skin-homing CD4+ T cell differentiation. European Immunodermatology Society Satellite Meeting, Tubingen Germany, Sep 21 - 24, 2005. 水川良子1，高橋 良，塩原哲夫1（1杏林大・医・皮膚科）：アトピー性皮膚炎ではTh2 細胞の皮膚への遊走が障害されている. 第27回日本研究皮膚科学会総会，京都，平成14年8月2- 3日. 高橋 良, 水川良子1, 寺木祐一1,塩原哲夫1（1杏林大・医・皮膚科）：T細胞における CLAとFucT-VII発現のkineticsの違い（ワークショップ），第100回日本皮膚科学会総会，東京，平成13年4月6−8日. 高橋 良, 稲岡峰幸1, 塩原哲夫1, 滝川幸生2（1杏林大・医・皮膚科，1東京都立府中病院・歯科口腔外科）：ニッケルイオンが抗原提示細胞へ与える影響の基礎的検討（１）〜抗原提示細胞か らのサイトカイン産生〜，第50回日本医学検査学会，東京，平成13年5月24−26日. 高橋 良, 稲岡峰幸1, 塩原哲夫1, 滝川幸生2（1杏林大・医・皮膚科，1東京都立府中病院・歯科口腔外科）：ニッケルイオンが抗原提示細胞へ与える影響の基礎的検討（２）〜細胞分化に関す る検討〜，第50回日本医学検査学会，東京，平成13年5月24−26日. 高橋 良, 水川良子1, 寺木祐一1,塩原哲夫1（1杏林大・医・皮膚科）：ヒト皮膚ホーミングCD4T細胞のE セレクチンリガンド発現を直接検出する，第26回日本研究皮膚科学会年次学術大会 (プレナリー口演)，愛媛，平成13年9月7−8日. 寺木祐一1，高橋 良，水川良子1，塩原哲夫1（1杏林大・医・皮膚科）：炎症性疾患にお けるcutaneous lymphocyte-associated antigen (CLA)とfucosyltransferase (FucT)-VIIの発現と調節. 第100回日本皮膚科学会総会，東京，平成13年4月6−8日. 日皮会誌　111：519，2001.